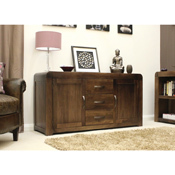 Dhaka is a stunning collection of solid Walnut furniture, manufactured by hand and finished to very exacting standards. Finished with a very slight stain and satin lacquer that is very resilient to heat and moisture makes this collection very simple to look after and keep looking at its very best. Modern gun metal handles complete to contemporary look. Beautifully curved corners give the Solid Walnut Nepal collection a very unique appearance and something a little different to the norm. 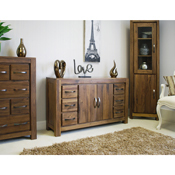 Hand made from the finest Walnut that simply has a very subtle stain and a tough and durable satin finish to withstand daily life. A simply lovely collection of unique Walnut furniture that will last for many many years to come with a little love very simple maintenance.